Starring: Denzel Washington, Chris Pratt, Ethan Hawke, Vincent D’Onofrio, Byung-hun Lee, Manuel Garcia-Rulfo, Martin Sensmeier, Haley Bennett, Peter Sarsgaard, and more. Now here is a change of pace for my reviews. 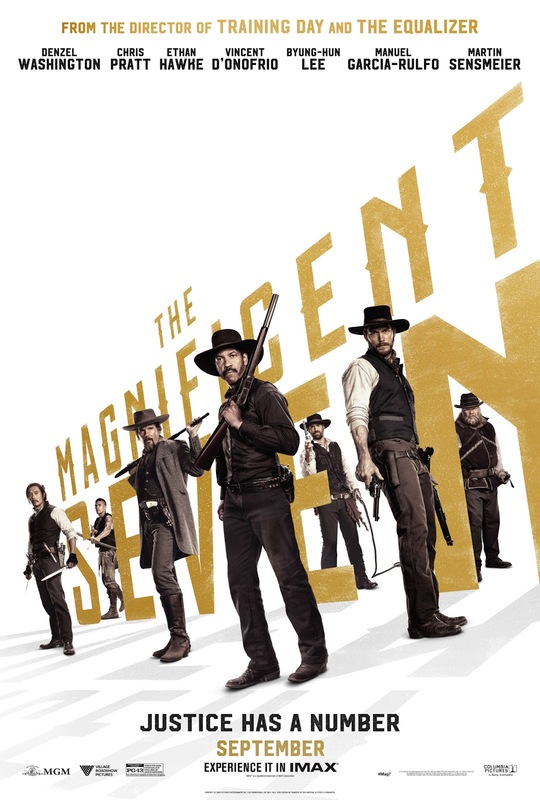 To finally break the horror/thriller streak (which might I add, is quite a welcome change of pace), we have an action/western remake to review in the form of ‘The Magnificent Seven’! September 23, 2016 brings the public release of this highly anticipated film but does it live up to expectations? With a star-studded cast, ‘The Magnificent Seven’ has a lot to deliver if it wants to live up to the hype. As a hard-working village is attacked and threatened to be taken over for the bountiful mines located nearby, a warrant officer, Sam Chisolm (Denzel Washington), is asked to give his aid, and mostly his guns, to fight off the attackers. Sam then recruits six more men to aid him in what seems to be an impossible task of fending off the ruthless Bartholomew Bogue (Peter Sarsgaard). No clever quips here. No dramatic intro drawing out my opinion. ‘The Magnificent Seven’ was everything I was expecting it to be. It was a wild ride from start to finish. It had that classic western feel to it while still being presented in crystal clear quality and having modern day effects… In the day and age of remakes and sequels, this was one done well. It was a strong and fresh take on the classic story and everyone felt natural while being witnessed on screen. Everyone was a strong co-star and no one felt like a “supporting” actor or actress, in my opinion. To me, Vincent D’Onofrio absolutely stole the show. Each time he opened his mouth he had me laughing in my seat and he was such a strong presence on screen, absolutely loved him. It was especially fun to watch him play his role of Jack Horne coming from my last viewing of him being Kingpin in the Marvel TV series ‘Daredevil’. Aside from Vincent, as I said before; everyone was a star in this film. I would name everyone but I would be drawing this review out too much for my taste… For any form of a negative critique, I would only say that I was not a fan of Peter Sarsgaard’s character, although I am not saying he did a bad job, I just did not like his character’s demeanor. Which, in turn, could simply just mean he did a great job at portraying Bartholomew. So in sense, no negative critiques! I highly recommend ‘The Magnificent Seven’. It is a great modern-feeling film despite being a western, while also dealing a great respect to the original. It is good entertainment for any film lover. Check this one out before it is too late!